When I was asked to blog a review about this CD, I thought about my oldest, Bookworm, taking the disc before I could review it…LOL. He is almost 11 and loves this type of music. However, notice I said that he likes this type of music. As for me, my taste in music is a little different than what I was asked to review. I didn’t feel this CD would be for me. Boy, was I ever wrong!!! 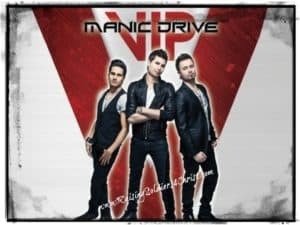 If you are looking for something new or something to add to your collection, I encourage you to give Manic Drive a try! This music group is a Godly Christian band. I have posted previously on the importance of listening to music that is considered a reflection of Christ. Honestly, there is no excuse in listening to ungodly, unfiltered music while expressing ourselves as Christians. The music we choose needs to be a reflection of who we say we are. The variety of great Christian artists makes this easier for us! As I listened to the CD, I was encouraged to not only worship God, but also want to worship Him. Sound confusing? The lyrics to many of the songs along with the music continues to replay in my mind, reminding me God is worthy of my praise. I can’t get enough of the CD! Lately, I have faced hardships (that I will blog about someday) and these past few weeks have been very discouraging. The day I got Manic Drive VIP and popped it in, I just truly felt peace and worship. I felt the need to let go of these hardships, give my troubles to God, and give God what He deserved – a heart completely turned to Him in worship. I did let Bookworm listen. HA! He thinks when I am not looking he can swipe it! This is definitely a CD the whole family can enjoy. My mom is 72 years old and she liked it. All three of my boys liked it as well. I urge you to give it a try and see for yourself! Get familiar with them on these sites & don’t forget to mention #manicdrive on your social posts!! Subscribers – Here is your chance to enter the giveaway for a free copy of Manic Drive VIP!!! If you’re not a subscriber, no problem! Just go to the top of the page and enter your email to subscribe!! Super easy! Just make sure that you confirm the subscription in your email. Previous Post: « Modest Monday: What I wore to the Dove AWARDS!!! Wow, what a great group.